A Video Encoder is a device or software that enables video compression and/or decompression for digital video. The compression usually employs lossy data compression. Historically, video was stored as an analog signal on magnetic tape. Around the time when the compact disc entered the market as a digital-format replacement for analog audio, it became feasible to also begin storing and using video in digital form, and a variety of such technologies began to emerge. There is a complex balance between the video quality, the quantity of the data needed to represent it (also known as the bit rate), the complexity of the encoding and decoding algorithms, robustness to data losses and errors, ease of editing, random access, the state of the art of compression algorithm design, end-to-end delay, and a number of other factors. Digital Video Encoder are found in DVD systems (players, recorders), Video CD systems, in emerging satellite and digital terrestrial broadcast systems, various digital devices and software products with video recording and/or playing capability. Online video material is encoded by a variety of encoder, and this has led to the availability of codec packs - a pre-assembled set of commonly used encoder combined with an installer available as a software package for PCs. Encoding media by the public has seen an upsurge with the availability of CD and DVD-writers. 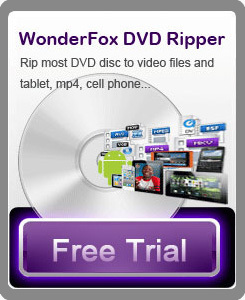 WonderFox DVD Ripper is the powerful and professional ripper software. It is a powerful DVD converter which supports to convert DVDs to 113 kinds of popular portable devices and formats. And WonderFox DVD Ripper has more features, click here for more details.